Did you know that for every issue, the New Yorker magazine receives around 1000 cartoon submissions and is only able to publish about 17 of them? That almost makes me want the New Yorker to come out more often, except for the fact that I can hardly keep up with all of the articles as is. Maybe they could come out with a weekly cartoon supplement. Or in New Yorker terms, an “idea drawings” supplement. 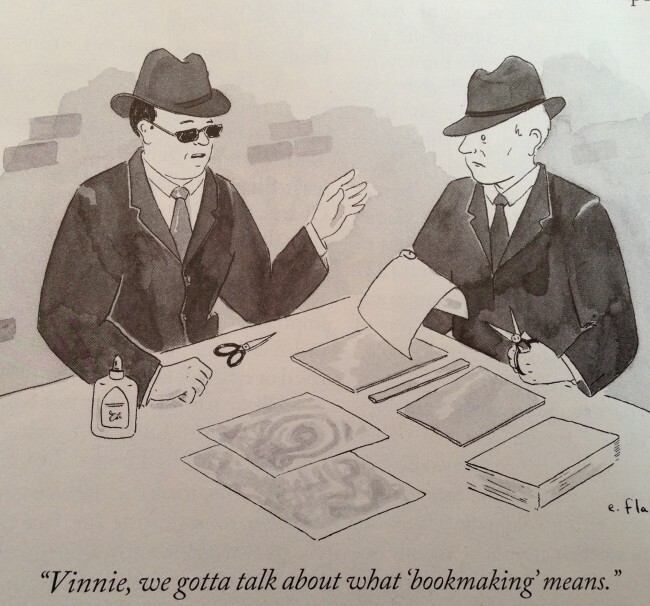 In his TED talk, “Anatomy of a New Yorker Cartoon” (link here), Bob Mankoff, the New Yorker’s longstanding cartoon editor talks about what it takes for a cartoon to make it into the magazine and additional interesting tidbits about cartoons and the New Yorker. Because Mankoff speaks so conversationally, and with a great deal of humor, I felt like I was in the room with him, although I wish the camera hadn’t scanned the audience so much. It is a bit uncomfortable when Mankoff shows a cartoon and the camera focuses in on the one person who clearly doesn’t get it. That shifting gaze, that blank expression, that sudden forced burst of laughter that is purely shared so as not to feel left out or foolish. Admittedly, I had to pause the video for one or two of the cartoons because at first glance, I was one of the awkward people wondering what I’m missing that is causing everybody else to laugh. With the extra minute to scan the cartoon, I thankfully got it and laughed, legitimately. My favorite part of the speech is when Mankoff talks about how the New Yorker carefully chose their cartoons for the issue that came out just after 9/11. He shows some of those cartoons, also, and while they made the audience laugh, it was a different kind of humor, the distinctions clearly explained by Mankoff. The talk is funny, fast-paced and full of insight. It is well worth the short 18 minutes of your time. In my humble opinion. Link to Bob Mankoff’s TED talk here. Wow, he kinda looks like an older version of a guy I used to work with.